A few months back, I blogged about the Singer 160th Anniversary Sewing Machine and how awesome it is. 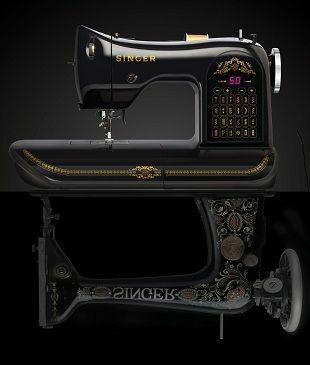 It resembles the vintage black and gold sewing machine but it completly digital and electronic. I came home and didnt even notice a package in the front room until my husband called me downstairs. My hubby was in on the surprise with my dad, I had no idea that he got me this sewing machine! I dont know if it was my pregnancy hormones or my state of shock, but I started crying tears of joy when I saw this box sitting there. I havent used it yet, surprisenly, I opened it up and pulled everything out, but with everything going on, I am waiting till things quiet down so I can enjoy it. Arabella was more excited I think to see it, she wants to learn how to sew, and now with another baby on the way, she wants to learn to make baby blankets. How cute!!! I am thinking about doing some DIY projects on here using my new sewing machine ( which I need to name) hahahaha. Do you geek out over sewing machines too, or am I the only one???? ?